Candlelight Farms Inn Wedding Pics show the allure of a timeless country venue. Built in 1843, the Candlelight Farms Inn is located on the top of Candlewood Mountain on a magnificent 640 acre property. Throughout the years, Candlelight Farms Inn Wedding Pics have demonstrated how enchanting and memorable a wedding at this location can be. The wedding pictured above took place on a gorgeous Connecticut summer day. The image is one that captures the feel and charm of a country wedding. In the picture, the wedding ceremony is taking place in a field with a picturesque backdrop of trees and open skies. 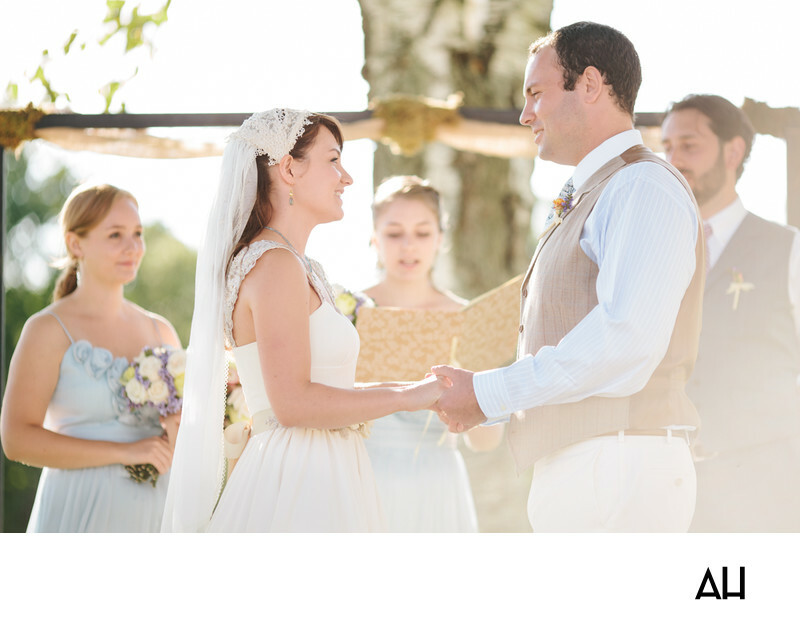 Above the ceremony, the sun shines brightly and creates a dream-like glow. The scene is natural, bright, and in a way heavenly. At the center of the photo, a bridesmaid reads the bride and groom their vows. She reads calmly, as another bridesmaid and a groomsman look on affectionately. The bridesmaids wear long, flowing baby blue dresses and they hold bouquets of white, yellow, and purple blooms. The lightness of their dresses complement the airy grace of the bride’s gown. The bride’s simple, ivory dress is adorned minimally with thick lace straps and a bow that is tied about her waist. The bride’s hair is pulled back with a lace headpiece that attaches to the long, sheer veil that floats down the back of her dress and rests on the grass. She gazes into the eyes of the groom, joy radiating from her eyes and a content smile forming on her lips. The groom wears tan dress pants and a light brown vest over a dress shirt that is designed with pale blue stripes. He holds the bride’s small hands gently in his own and looks at her adoringly. The couple is a vision of pure love as they prepare to promise to cherish one another for all the years to come.